Milagai bajji is a very popular street snack in India. There are many fans for this milagai bajji, hence wanted to do a separate post for this. You can make this with or without stuffing. I have tried both versions and both tastes great.Today we will learn how to make both the version of this chilli bajji following our easy recipe. In a shallow bowl, mix together gram flour, cooking soda, salt and chilli powder. Then add water, a tsp of oil and prepare a slightly thick batter. I added little less than 3/4 cup of water. Taste the batter to check for salt. Add if required. (suppose if the batter becomes watery, add little more besan and mix well). The batter should neither be too thick nor too thin. Once the oil is heated, reduce the flame to medium. 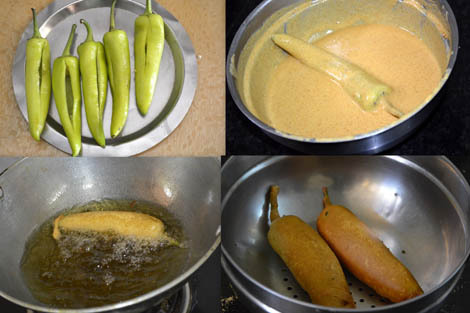 Now dip the chilli in the bajji batter in such a way that the chilli is well coated with the batter on all sides. Then drop the chilli gently into the oil. Fry both sides until golden brown. Remove from oil and drain on a paper towel to absorb excess oil. Repeat the same process for the rest of the chillies. 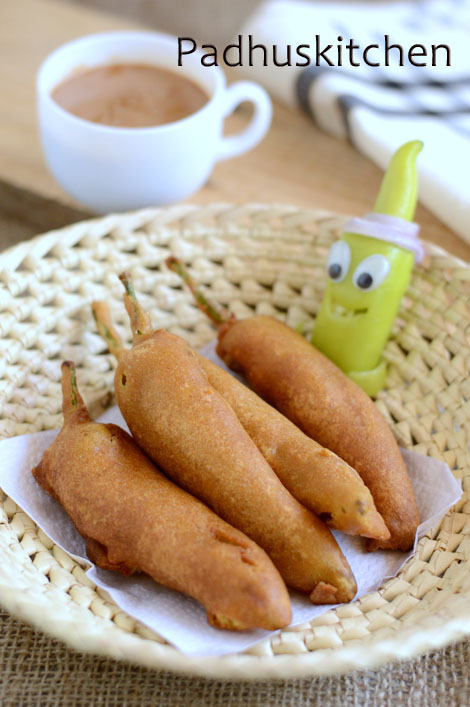 Enjoy hot milagai bajji with a cup of steaming hot tea or coffee. The stuffing I used is more or less similar to my onion samosa recipe. Mix all the above ingredients together in a bowl. Make a vertical slit and remove the seeds inside the chilli. Stuff the chilli with the onion mixture and then proceed as given above. Note - You can use even potato sabji as stuffing. That's quite a tempting stuffed chilly.. Loved it, something new to me !! I love chilli bajjis. Want to grab all in the plate..
Hi padhu, PLz post Capsicum Bajji.